Having decided to educate their children independently, its important that your clients are fully aware of the financial implications of such decisions and can be confident that they can afford the fees throughout the selected term. Mr and Mrs Smith both aged 35 live in the Middle East and have a one year old daughter. Mr Smith is the managing director of a software company and Mrs Smith is a full time mother. They contact their financial adviser to discuss their options. They explain to their adviser that whilst they acknowledge there will be additional costs involved such as transport, uniforms, school lunches, their main focus is to build a fund to pay the tuition fees. In addition, they accept that the cost of tuition fees etc will continue to increase each year, so with their advisers help, agree that an annual fee increase of 7% is a reasonable assumption to make. Their adviser suggests that they use Quantum to build up an education fund to pay for the fees when they become due. Using the information provided, their adviser calculates what the future costs could be when their daughter is ready to start secondary school by using the Education fees calculator. The results produced show that the total estimate for just tuition fees could be over USD369,000. Using the Quantum illustration system, a monthly premium of USD2,185 over 10 years is required to meet these estimated costs assuming a growth rate of 5% per year. 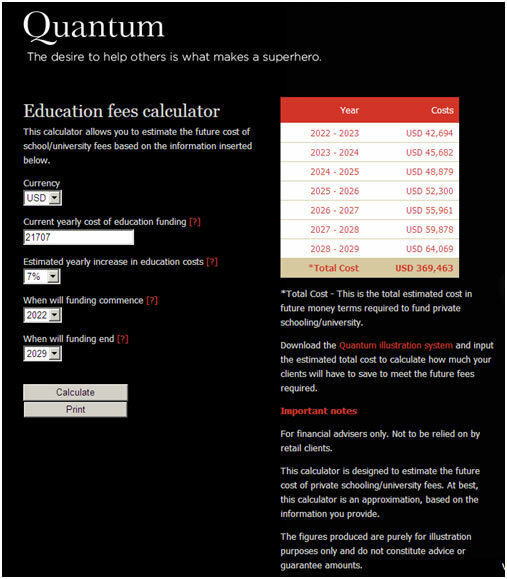 Why not show your clients some personal figures that match their expectations and time scales using the Education fees calculator and Quantum illustration system. The figures produced in this case study assume that the tuition expenses increase at a constant rate each year. In reality, annual increases if any are prone to variance and future increases cannot be predicted.